Whitney and I have added quinoa to the list of staples that we keep stocked in our pantry, and in addition to using it as a side every now and then, we also like to find dishes that feature it. 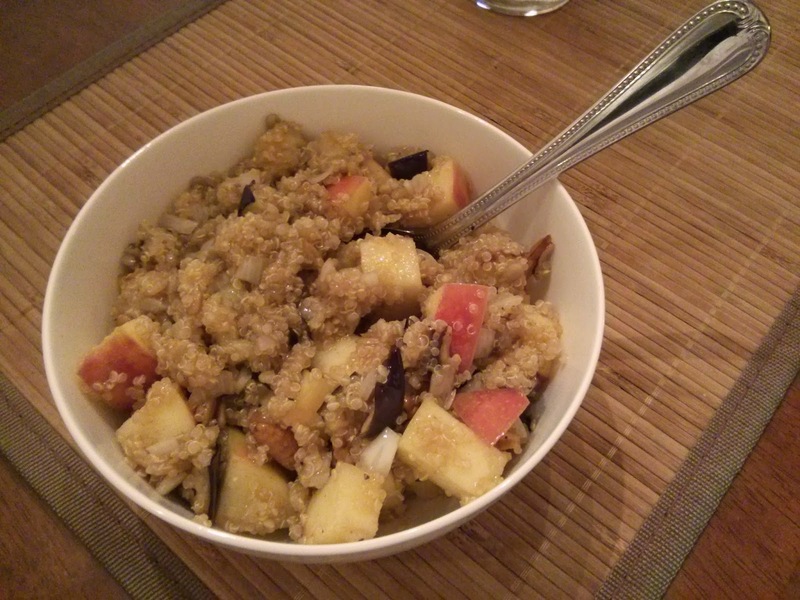 This quinoa salad is an excellent example, and is probably my favorite preparation that I've had. The quinoa absorbs the tasty vinaigrette, and when combined the fruit and nut flavors form the salad creates a very delicious and flavorful dish. I'm definitely excited to do this one again! For the vinaigrette: Toast the seeds over medium heat in a heavy medium skillet, stirring occasionally, until the seeds darken in color and become fragrant, 3 1/2 to 4 minutes. Place the seeds on a plate; cool for 1 minute. Grind the seeds finely in a small food mill or grinder. Whisk the oil, vinegar, salt, pepper, cinnamon, cloves and the toasted seeds until thick and blended in a small bowl. Stir in the shallots. Set the vinaigrette aside. For the salad: Place an oven rack in the center of the oven and preheat to 400 degrees F.
Bring the broth to a simmer over medium-high heat in a heavy medium saucepan. Mix in the quinoa. Reduce the heat to medium-low. Cover and simmer until the water is absorbed and the quinoa is tender, about 15 minutes. Turn off the heat and let the quinoa stand, covered, 5 to 10 minutes. Cool and fluff with a fork. Meanwhile, spray a large rimmed baking sheet with vegetable oil spray. Toss the eggplant with 3 tablespoons oil, 1/4 teaspoon salt, and the pepper on the sheet. Roast until tender and browned, stirring once, about 30 minutes. Transfer the quinoa to a large bowl; fluff with a fork. Add the vinaigrette, eggplant, apples, walnuts and cranberries. Toss to blend. Cover the bottom of a shallow platter with the watercress. Spoon the salad on top and serve. I do want to try this. I just learned about quinoa this fall at a Caulkins Labor Day get together. I think Pat and Dave made the quinoa dish, but was good. I have served it several times - always added sautéed veggies and jimmy and I both like it. Hello from the Eibls! We're newlyweds (but not so "newly" anymore) settling in the Carolinas. Follow along as we share kitchen adventures and life snippets. Come for the recipes; stay for the cat pics!